Train to Glasgow. Seriously, one of the best ways to spend a day in Edinburgh is to take the train to Glasgow with three or four friends. Using the ScotRail GroupSave Day pass, it is ridiculously cheap, and only takes 50 minutes! Glasgow is where all the best concerts, Charles Rennie Mackintosh architecture, vegan pubs, and Indian food can be found. 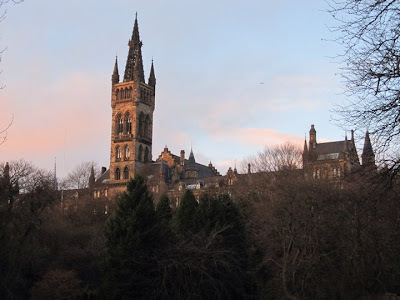 University of Glasgow as seen from Kelvingrove in the amazing West End. See Camera Obscura. It's fun. It's cool. 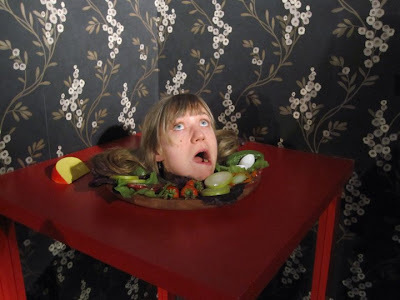 It has optical illusions. Great for kids of all ages, and our favourite of the tourist attractions along the Royal Mile. Don't panic... it's only an illusion. Take in the Christmas Fair. 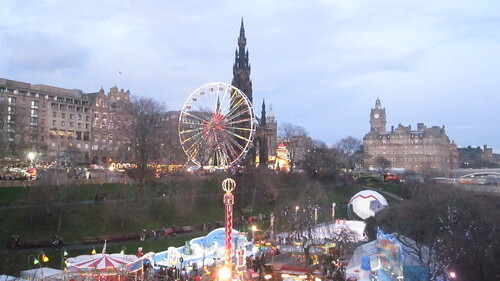 For the whole of December, the Mound is transformed into a winter wonderland of rides, mulled wine, and fantastic crepes! Christmas as seen from the Mound looking east. Climb Calton Hill. At the east end of Princes Street is Calton Hill, a manageable climb for even the most severely sedentary. The views from the top are fantastic. And if you need more exercise, the Nelson Monument is a further 170 steps and a great history lesson in both naval timekeeping and warfare. A southern panorama from the top of the Nelson Monument. in the foreground and New Town behind. Crawl the Pubs of Rose Street. The tradition is to attempt to consume a pint at each of the 13 pubs in one day along this famous New Town lane. Sounds like one of those impossible urban myths, like drinking four litres of milk, seven saltine crackers without water, or an entire tablespoon of cinnamon. Hint: order a half-pint of low-alcohol cask ale at each, or only hit the best of the street: The Abbotsford, Robertson's 37, Rose Street Brewery, and the Amber Rose. Chris the bartender at Rose Street Brewery. Drink Like a Local. As noted in Irvine Welsh's Trainspotting, only the tourists drink on Rose Street. The real pubs of Edinburgh are often insanely hidden (Star Bar, Bramble, Out House), or off the beaten track (Leslie's, Victoria, Elbow). But definitely worth the effort. After a few pints you'll find yourself seamlessly slipping words like aye, wee, and ken into your conversation. Eat at a Late Night Chippy. Nothing puts a cap on a good night of pub crawling like some take-out from a fish and chips shop kind enough to be open at 3:30AM. The menu is rarely limited to just fish: falafel, donair, fried pizza, scampi, and an assortment of other delicacies are usually featured. Our favourites include Uncles, Che's, and Cafe Picante. Avoid the black pudding: it's not chocolate jell-o pudding. Shop Victoria Street to the Grassmarket. The elevated sidewalk along Victoria is so medievally cool, as are the shops along the way. Stop for a pint at Bow Bar, and some corduroys at Walker Slater. At the bottom of the winding slope, Victoria Street empties out onto The Grassmarket, a long stretch of pubs and restaurants and more boutiques - a great place to people watch. Grab a used LP at Avalanche Records, where the view of the castle is breathtaking. Victoria Street looking towards Grassmarket. Get Enlightened at the University of Edinburgh. Now that they have finally completed the courtyard of Old College, step inside and take a moment to soak up the atmosphere of the birthplace of the Scottish Enlightenment. At the main campus, sneak in for a pint at the Library Bar in Teviot House. Then find the footpath that takes you to the Meadows. 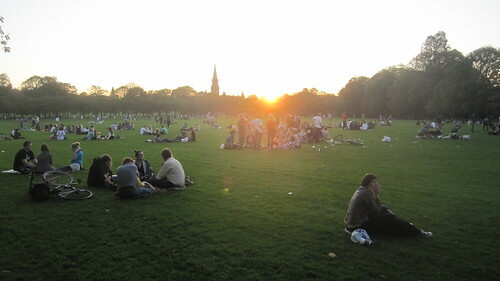 Lounge in the Meadows on a Sunny Evening. When the sun comes out, take the day off and head to the Meadows to hang out with the thousands of students and locals who gather to play footy and bar-b-q. Don't forget to visit Bruntsfield Links at the far west end, but watch out for flying golf balls: it is still in use as a pitch and putt! Grab a pint at the Golf Tavern. Hang with the Order of Thistle at St. Giles' Cathedral. The churches of Edinburgh are not as spectacular as other parts of the UK and Europe, but St. Giles' is worth the time mainly because of the Thistle Chapel, home to Scotland's order of chivalry. Attend a Concert at the HMV Picture House. The acoustics are fantastic, there isn't a bad seat in the house, and the bar is never far away. If the balcony is open, head up the stairs and grab a seat. 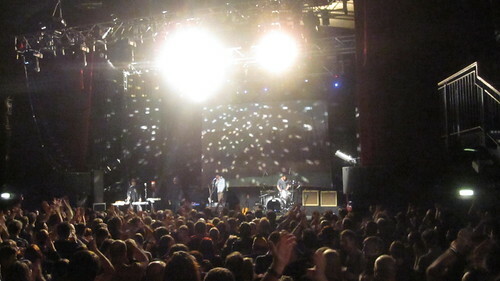 The band Cake performs at HMV Picture House. Visit the Stockbridge Market. The gentrified neighbourhood just north-west of New Town features an open air, dog-friendly market on Thursdays and Saturdays. After you've bought some handcrafted soaps, curries, coffee, etc., venture across the bridge and grab a pint at the Stockbridge Tap. Cross the Dean Bridge and Explore Dean Village. The view of the city as you approach from the north of Dean Bridge is special. Down below in the valley cut by the Dean River is a series of walking trails that will take you as far afield as Leith and Queensferry. But our favourite part is the remnants of the former Dean Village where several mills operated. 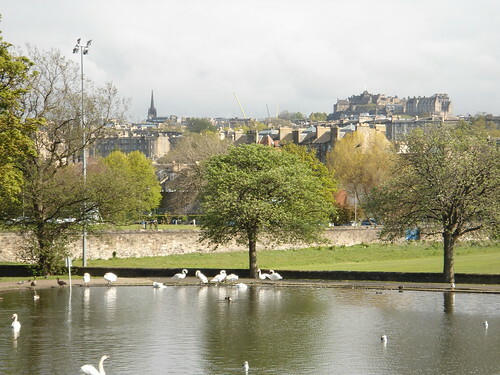 Explore Inverleith Park and the Royal Botanic Gardens. One of our favourite Sunday walks was to head through Stockbridge along Raeburn Place, make a right on East Fettes (named for the school that looks like Hogwarts) and cut through Inverleith Park. Check out the swans! The view back to Old Town and Arthur's Seat can often surprise. Eventually you will come to the entrance to the Royal Botanic Gardens on Arboretum Place. Get Wind-Blown Atop Arthur's Seat. 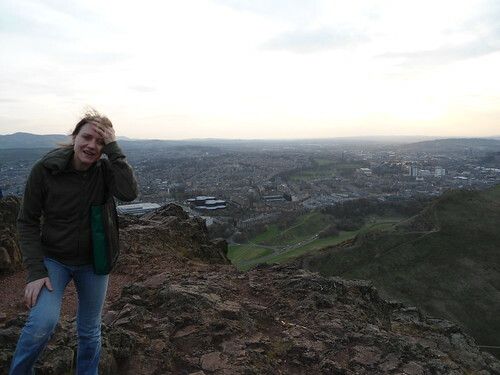 A much more serious climb than Calton Hill, the dormant volcano at the east end of the Royal Mile that rises up above Holyrood Park rewards the intrepid hiker with some face-stinging winds and fantastic views. Get Cultured at the Free Museums and Galleries. The publicly owned museums and galleries are free of charge. Of particular note are the National Museum of Scotland, the Scottish National Gallery, and the Scottish National Portrait Gallery. Watch Fireworks from New Town. 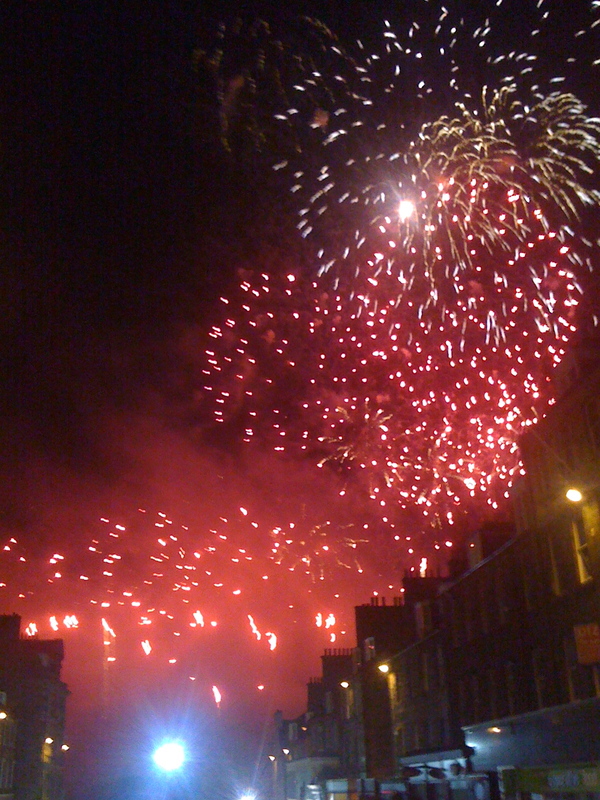 This city loves fireworks, and finds excuses throughout the year to set them off, be it the end of the Festival, Dusherra, Guy Fawkes day, Hogmanay, Beltane, or the Military Tattoo to name a few. New Year's Eve looking south along Frederick St. 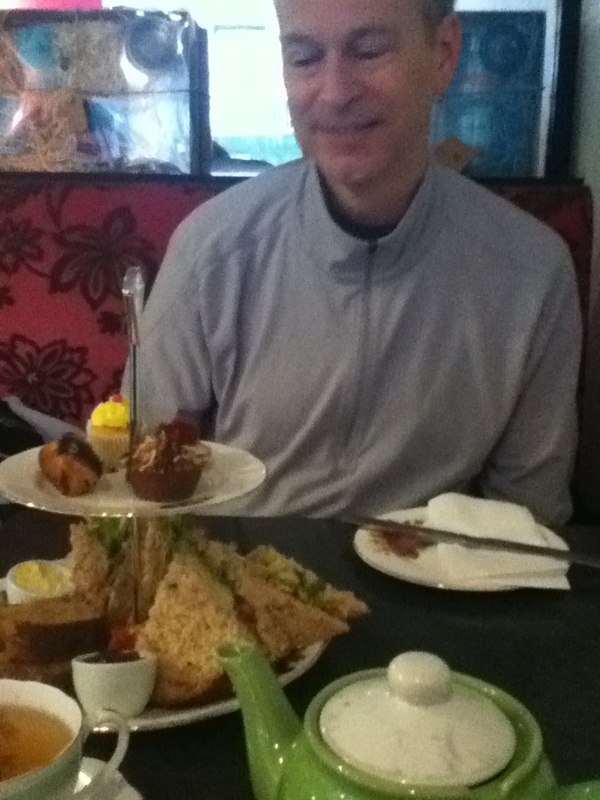 Tea Time at Eteaket. There is no shortage of French cafes or coffee shops like Costa to enjoy a mid-afternoon sweet, but our favourite place is Eteaket on Frederick. If coffee is your thing, the Starbucks on Princes features a fantastic view of the Castle. You'll have had your tea. Be a Stairmaster and Climb the Scott Monument. Looking like a gothic version of Sleeping Beauty's castle, or the top of a church chopped off and plunked down on Princes Street, the Scott Monument is actually climbable and offers sweeping views of the city centre.